I have a love/hate relationship with gifts and gift giving. I LOVE giving gifts. I especially love when I find the "perfect" gift for someone. Most of the time though, when birthdays and Christmas roll around, life is so crazy that my mind goes completely blank and I can't think of anything to buy my favorite people. Today I want to chat a little bit about picking gifts for kids and get some of your ideas. 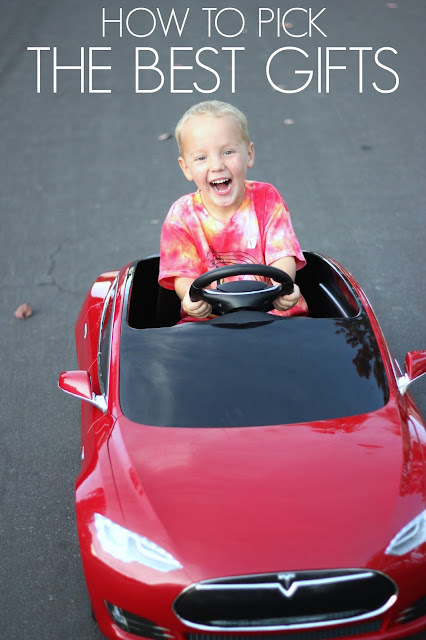 I am also excited to share about our new favorite gift from Radio Flyer--> the Tesla Model S for Kids. It is pretty much the coolest thing ever. To pick the best gifts for kids and make sure they are on time and wrapped before a big holiday or birthday, it is important to plan ahead... which is not one of my strengths. Sometimes I remember to keep a notes on my phone to jot down gift ideas for my siblings and kids as I get ideas and that is so helpful. We occasionally do online wish lists as well. There are a lot of different philosophies when it comes to gift giving and quantities of gifts and traditions. One thing that I liked to remind myself (and my kids) is that each family needs to do what works best for them, their budget, and family culture. As a family of six we have a lot of "stuff." As we grow as a family we've tried to become more intentional about our gift giving. Christmas and birthdays are busy and kids open up a lot of presents. I love to give them something to look forward to after the holiday. One thing I love to give is the gift of an "experience." It might be a trip to a local children's museum, a date night out to a favorite restaurant, or a soccer class that they've been wanting. Experiences can be inexpensive (sometimes even free) and they also don't add to toy clutter that you may already have at your house. Kids are only little for a little while. I love giving one unexpected surprise that will just knock their socks off and be memorable. I love seeing their little faces light up and be SO EXCITED. I still remember the Christmas when I was 5 that I got a special doll house that I had been wanting forever and never thought that my parents would buy for me!!! I loved it! I also often prefer to give one big nice (or a little more expensive) gift versus several little gifts. 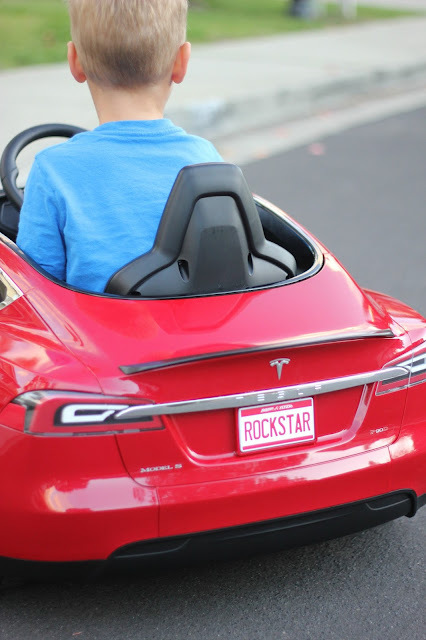 Recently my kids were sent a Radio Flyer Tesla Model S from Radio Flyer as an unexpected surprise and my kids are IN LOVE with it. My 4-year-old has been especially head over heels over it and every time he drives it out of the garage he has friends (and his big siblings) wanting a turn. It is awesome, and GORGEOUS. My husband really wants his own grown-up Tesla, so he's pretty jealous that the kids have one right now. We even got to customize the color, performance accessories, and license plate. Radio Flyer is giving away one free Tesla for kids as part of their 25 Holiday Giveaway if you want to check it out HERE and win one for yourself. Have you gotten a special surprise gift before that was really memorable? I would love to hear about it! I think giving and receiving useful things for birthdays and holidays is also fun. My kids actually do too. A new winter coat, basketball shoes, and even sometimes cool character underwear can actually make them really excited. We only replenish things when they are pretty worn out, so anything new is always loved and appreciates. My daughter really enjoys listening to music. Not long ago we just took an old iPad music player that we don't use that often in the rest of the house and gave it to her as a gift. It wasn't anything new, but she has loved having a way to listen to music in her room. Giving the gift of time or gift of your talent can be really special. Baking something for someone, making a homemade gift using your talents, or even giving a coupon for an afternoon of playing games together could be fun. Each child is so different and experiences love in a different way. Although some kids love getting tons of toys, some kids are content with a simple gift and then having time spent with mom and dad or a big sibling. My kids also love to give the gift of sweet notes, cards, and posters for important events like birthdays and other celebrations. For each child's birthday we decorate bedroom doors with posters and kind notes. It is by far always a favorite gift and they get left up and appreciated for months. I love hiding a present or two and then not finding them till after Christmas or a birthday. Stashing a gift card away for a rainy boring day can be fun too. Gift cards can be fun for older preschoolers and school ages kids to get since it gives them an opportunity to go shopping and learn about how much things cost, how to budget, how to make choices, and how to talk to other grown ups when they are making their purchase. Time together as a family is a gift. My kids really relish their annual birthday and half-birthday dinners that we do. We sometimes go out to eat and sometimes we stay home and make their favorite dinner. We always have cake or ice cream (or both) and the kids get to pick what we have. I love seeing how their choices change as they grow. Gift giving can be overwhelming and time consuming if you don't have a plan. As we go through each of these categories listed above for birthdays and holidays it becomes much easier to brainstorm ideas and make decisions on what to give kids and family members. We try and avoid just giving piles and piles of toys and instead work on being intentional about how we give gifts. 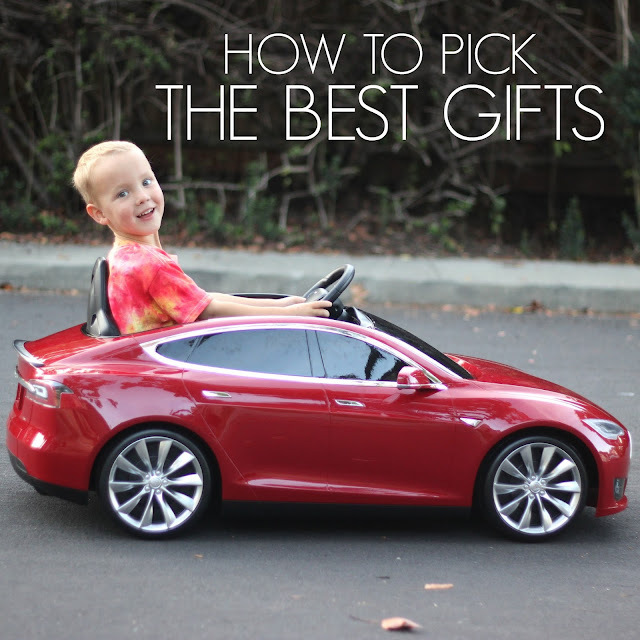 How do you decide what gifts to give your kids? What has been the most memorable (or loved) gift you received as a kid? What has been the most memorable (or loved) gift you have given to a child? Thanks Radio Flyer for sending us such a fun surprise! To learn more about the Tesla Model S for Kids by Radio Flyer, check out their website here or following along with Radio Flyer on Facebook or Instagram.